This guide begins with how to use the A1WebStats system to extract data related to products or services pages that your website visitors have visited. It then moves on to a strategy that will lead to you gaining more enquiries/sales about any product or service that you offer. 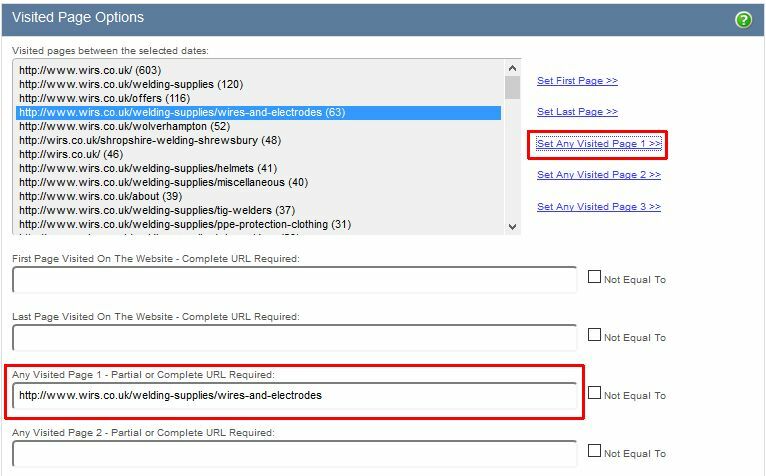 First, identify the page url of the product or service that you’re interested in. Then, from the Dashboard, select a date range (using the date picker tool on the top right), within which people have been to that product or service page (typically, a month is about right). 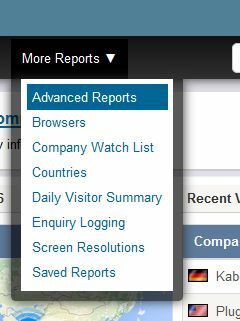 Next select ‘Advanced Reports’ after hovering over ‘More Reports’ in the main navigation bar. Scroll down the page to the ‘Visited Page Options’ section. Then click on the product or service page url that you’re interested in. This highlights it in blue. Now click on ‘Set Any Visited Page 1’ to the right of the scrolling list. The page url you chose will now be inserted into the third box below the scrolling list. This will show you the Total Visitor Records that got to that page during the time period you selected. If you want to filter your visitors to only those from your home country then follow this step. Otherwise (if your potential customers could come from multiple countries) jump to step 7. 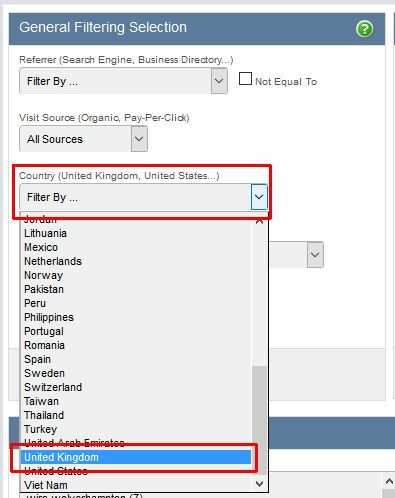 To select data for just visitors from your home country scroll up to the top of the screen and within the General Filtering Selection part of the page, filter by Country and select your country of choice. 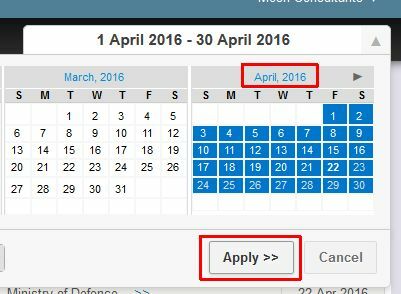 Then click on ‘Apply Filter(s)’. This will further filter the data to only those who you considered to be ‘potentially useful’ (i.e. within one country) who got to the product or service page. Tick the ‘Select All’ button and then ‘Create Report’. The report that’s produced will show you how each of the total visitors navigated through your website to the product or service page that you are analysing. You should look through each of those visits and endeavour to step into the shoes of each person who got as far as that product or service page. What pages did they look at before, and after your page of interest, and how long did they spend on each page? Are there any clear patterns coming out of the data? Now take the number of visitors figure from the top of the page and compare that number to the number of enquiries you had about that product or service during that time period of analysis. You are asking yourself the question: “how many of those visitors to that product or service page found enough within the website to make them want to get in contact?”. Another way to put that is to ask “why didn’t they make contact, and so potentially went to a competitor?”. Our recommendation is to go through steps 1 to 9 to cover a longer duration of time. Depending on how long you’ve been using A1WebStats, you may have longer historic data, which could result in a more accurate picture. 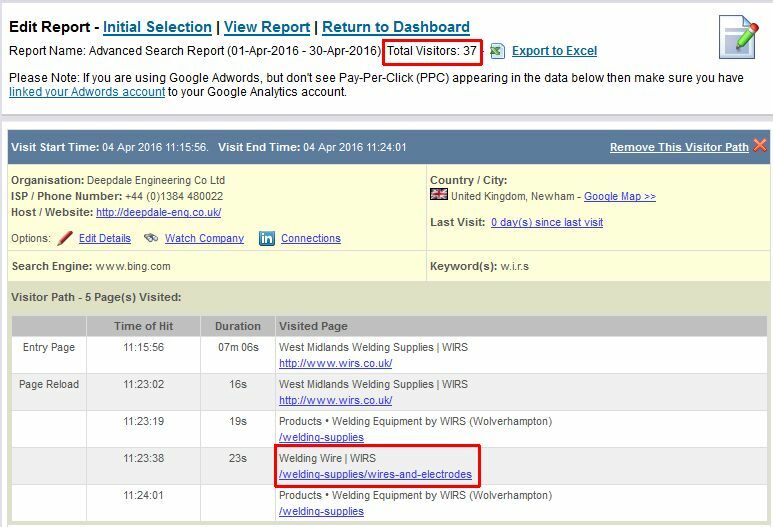 In the example below you can see data from a spreadsheet that calculates the enquiries gained compared to the number of visitors to each widgets product page. The analysis has been undertaken on three separate product (widgets) pages, over a period of two months. Taking that example, the widgets company would see that the Red Widgets product had the strongest levels of enquiries, even though that page had the lowest number of visitors. This allows them to analyse whether there’s something particularly strong about that Red Widgets page (and supporting pages), compared to other widgets pages. Whether you are analysing a short or longer period of time, you should gain a clear picture that will often indicate that you have weak enquiries about a product or service, when compared to the number of visitors to that page. Now we can move on to what you can do about it. In this example we’ve used the subject of a product called ‘spur gears’ – something that would likely to be part of a range of ‘gears’ products within a website and so would likely have a product page dedicated to it. First you need to search for the product in Google to get a page of results. 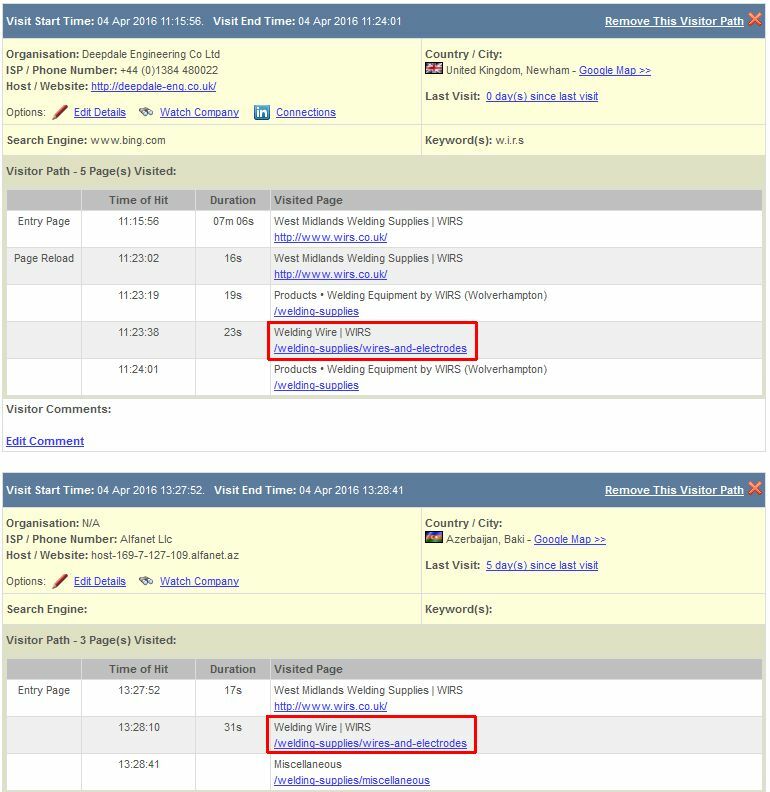 After eliminating pages that aren’t what you would consider ‘competitors’ (for example, in the example above there’s a page describing how gears work), but still including paid advertising links, click on each of the website urls one by one. As you go to each website you are looking for elements of the landing page (or the pages that people can click off to) that look particularly strong to you. You should be recording details of each website and what you thought was strong (i.e. elements that a potential customer would respond positively to). The product or service page is supported with numerous testimonials specifically related to that product or service. Those testimonials are from named individuals within named companies and ideally include the date of each testimonial. In some cases the geographic location of the client is relevant to include. Most importantly, the testimonials should be about the product or service itself, not generically about your business. Similar to testimonials, the product or service page is supported with numerous case study introductions, specifically related to that product or service. Those would typically be brief introductions to each case study, encouraging people to click on a link to see each case study in more detail. For example, if the potential client is looking at a page about spur gears then they are more likely to make contact if the page also contains summary introductions to more detailed case studies specifically related to spur gears work that has previously been undertaken. Pricing – although pricing is avoided on many websites, for some types of products or service, potential buyers do at least want to get an indication of the pricing because many people won’t make contact if they feel it’s being hidden from them. Imagery – for some types of products or services, supporting imagery can be effective. Sub-division within the landing page. Taking the example of spur gears, that product can be sub-divided into pages/sections that focus on both metal and plastic spur gears, which will appeal to the potential buyer interested in the type of material involved. Video – for some products and services, video may be appropriate. Downloads relevant to the product or service – PDFs for example. Live chat – it’s still stunning how many businesses don’t utilise a live chat facility, whether manned internally or using a hosted service. Whether that website is using Google remarketing. You won’t know this at first but if you start getting followed by adverts related to the websites you’ve been to, then you’ll see that you’ve been missing out on an obvious ‘win’. If you don’t get followed by those adverts then it could mean there’s a golden opportunity to be ahead of your competitors. Detailed specifications (in cases where there are products or services where the potential buyer wants the option to see a lot more detail within the website instead of having to make contact to get that detail). Our recommendation is for you to continue looking through the websites of competitors until you’ve looked at a minimum of 10 and perhaps up to 20. The more you look at, the more chance there is that you’ll uncover aspects of their websites that you think are particularly strong. A potential buyer is quite likely to look at several websites as part of their research into who they want to engage in dialogue about a product or service. It’s also quite likely that they will have utilised a search engine (particularly Google) as part of the process. That potential buyer will have gone through the same process as you’ve just been through. They will have found elements of strength in some websites but have probably been frustrated that no website has impressed them in many ways. Your job is to take all the strengths you’ve identified and find a way to build those into your own product or service page. It’s quite likely that you will identify elements that would benefit several of your website product or service pages (for example, utilising testimonials within each product or service page), and sometimes it’s wise to discuss bigger changes with your website developer. For example, if wanting to include testimonials related to specific products or services, it can make more sense to modify your website structure so that those are created in the back end of the website and are automatically displayed on relevant pages. 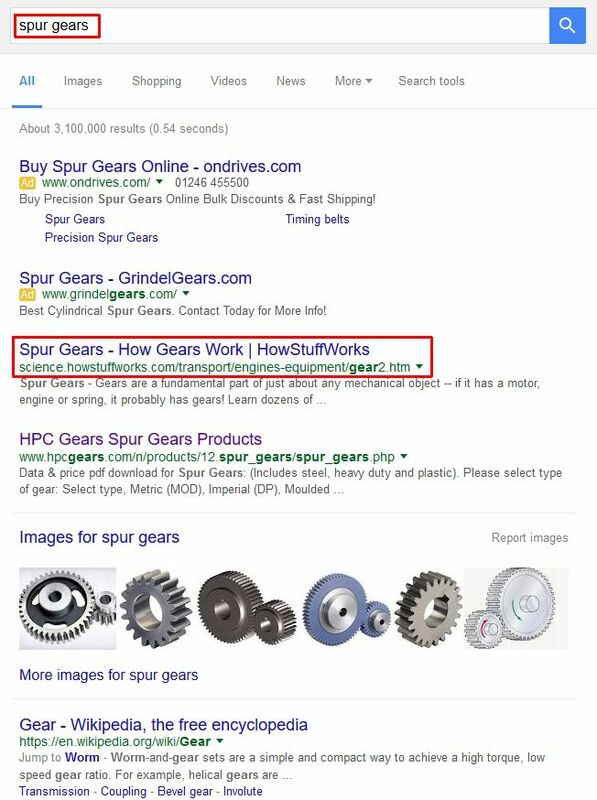 Taking spur gears as an example, a website owner could create lots of testimonials and ‘tag’ some of them as being relevant to spur gears, which would automatically make them appear on the spur gears product page. Of course, this is not a small undertaking. When you go through the process of identifying the “that’s nice” elements of competitor product/service pages, you’ll end up with a big wish list of elements that you want to build into your website, and that can be quite daunting. It’s worth returning to the only thing that’s important: the potential customer, who is waiting to be wowed. You may not be top of Google for your product or service but if a potential customer goes through a few search results and then finds your super fantastic new website page containing everything they could possibly want, then they’re not going to spend much more time researching because your website offers them so much more than they’ve already seen. If you’re already high in Google results (paid advertising or organic), even though you know the potential customer is still going to look at a few more websites, they’re not going to find anything as impressive as what you’re now offering so they’ll return to your website. Systems like A1WebStats help to focus attention on products or services that are not getting enough enquiries compared to traffic to those pages, making it obvious that something should be done about it. So why is there so much apathy amongst businesses that could clearly be getting more enquiries about products or services? Unfortunately, it often comes down to a lack of analysis. No-one is asking the right questions within a business. No-one is saying “why aren’t we selling more of X, Y, or Z?”. If those questions were asked and analysis undertaken, it would be clear where the weaknesses are and, through borrowing strengths from competitors websites (and combining them all together), website success is guaranteed. All it takes is to look at what other people are doing well on their websites and then to equal or better it. Raising enquiry levels for products or services is no more complicated than that. Still not sure how to make this work for your business? Just contact us – we have many years of website success experience and are always happy to provide some free tailored advice to A1WebStats subscribers.